Attorney says JPD won’t let him file charge. A Mississippi attorney is claiming he’s being denied from filing an affidavit against a former Jackson Police officer. 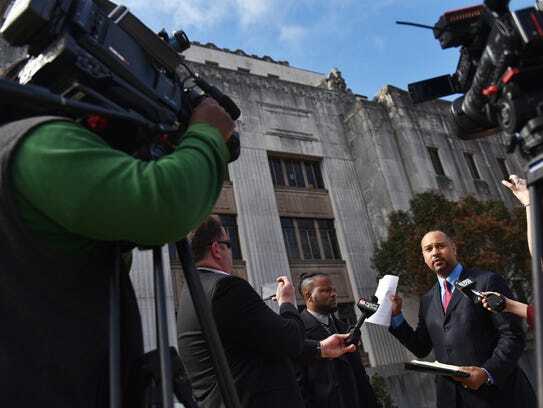 Grenada based attorney Carlos Moore was at the Hinds County Courthouse Wednesday, attempting to file an affidavit on behalf of his client, Adrian Jackson, against former JPD officer Justin Roberts. Moore said he attempted to file an affidavit at the Hinds County Justice Court, Hinds County Sheriff’s Department and Hinds County Circuit Clerk’s office. After an unsuccessful day in the court system Wednesday, Moore said Jackson plans to sign an affidavit against Roberts Friday at JPD. JPD Commander Tyree Jones declined to comment, citing potential litigation. Monica Joiner, attorney for the city of Jackson, did not return calls for comment. In December 2013, Jackson was shot in the back multiple times by Roberts at a Jackson nightclub where Roberts was working at a security guard. According to a JPD incident report, Roberts shot Jackson shot five times. Jackson claims he was shot seven times. Jackson said he was in the hospital for a year trying to rehabilitate and had to drop out of college at Jackson State and entered a state of depression. Moore filed a civil suit against Roberts in 2015, the same year he was reportedly hired as a police officer with JPD. “When I found out he was an officer, I was flabbergasted,” Jackson said. Roberts was fired from JPD Monday after a video surfaced of him appearing to strike a handcuffed suspect. Moore also represents the handcuffed man, Ladirus Brown. Moore claims the incident involving Brown could have been prevented if JPD never hired Roberts. Moore said he is hoping that, by filing an affidavit, Roberts will be unable to work as a police officer anywhere else.